The fields are high and summer's day are few. Green fields have turned to gold. For gathering home into barns. The harvest is plenty, labourers are few. Come with me into the fields. Your arms may grow weary, your shoes will wear thin. 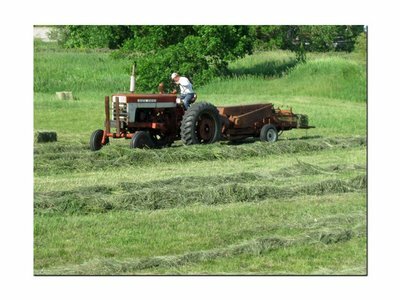 I hum that hymn whenever we are haying; especially when haying is going good. And it is going real good this year. All that rain we endured has paid off in hay, beautiful hay! Horse people – we love summer, but we worry about the winter. Hay to us is like nuts to squirrels. We gotta stock up! Once we know we have enough to get us through the winter, we can rest easy. Believe me, it doesn't always go this way. "Hay Stress" could be a certifiable sickness. As of today, these squirrels have nuts! Last night, the Platte River Riders were scheduled to ride on my friend's property. He has some gorgeous private trails and it's a "can't miss" ride. I was so anxious to ride there again, that I took the afternoon off to go early. Yeah, the best made plans… never go as planned. Ended up having to go in to work and watched the time come and go for the early ride. And was really doubtful I would make the ride at all. When I left work, I had 2 hours to get to the ride. In those 2 hours, I had to drive 30 miles home – 8 miles of it on gravel roads to avoid a road construction hold up. I got home in a little over 30 minutes. Then I needed to change clothes, hook up the trailer and fetch & load my horse. I got that done in 17 minutes. Then I had another 60 miles to drive to get to the ride. And along the way, get gas and pick up a friend, Mary, and her horse who were trailer-pooling with me. At 6:30 ride out time, I was 10 minutes from the destination. By the time we arrived, unloaded & saddled up, we were on the trail just 20 minutes late. THAT is how bad I wanted to ride! And it was worth every minute and every mile! Unfortunately, in my rush to get there, I forgot the camera for what is one of the prettiest rides of the year! Windy spent the night at Mary's house. I've been having some problems with my trailer lights and her husband offered to help. So when I dropped her and her horse off, too, we put Windy in one of her pens and dropped my trailer for his inspection. I'll pick them both up after work tonight. You are so lucky that you are getting some good hay! We have had such a wet spring and summer so far, that the farmers don't know when they are going to be able to cut and bale! There hasn't been enough dry time to do it. I sure hope it happens soon, because we also stock up for winter during the summer. Sounds like your ride was fantastic! I know just how you feel about hay, glad you've got yours already. We haven't but will shortly. Glad to hear that you made the ride. Getting there sounds stressful, but once you were out on the trails I'm sure it all stress melted away and the ride was great. I have never seen hay as beautiful as this year's. Glad you have a field to mow. You are so blessed to have fields that you can harvest for hay. Being that our cimate and terrain is desert dry, we don't have much grass growth, if at all, each year. We can never count on growing our own hay, that's for sure. We have to buy our hay, usually from California or Colorado all year long. Thankfully its always available, albeit a little more expensive during the winter. So, count yourself lucky that you can grow your own hay, allow your horses to graze all summer, and harvest it, too. Good for you and tenaciousness to be able to get to that ride in time to enjoy. Have Wheels, Can Travel.... Again! I'll Never Be Hungry Again!